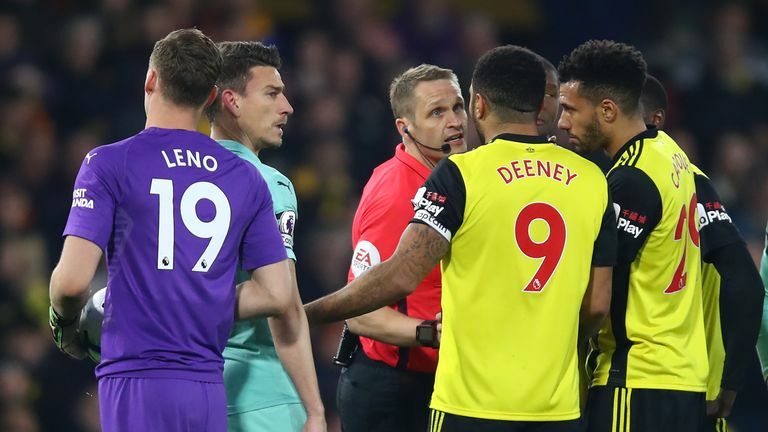 Troy Deeney was shown a straight red card for an elbow on Arsenal's Lucas Torreira but was the Watford forward unfortunate? Troy Deeney was shown a straight red card for an elbow on Arsenal’s Lucas Torreira but was the Watford forward unfortunate? The striker was given his marching orders after catching Lucas Torreira with an elbow early in the game, and is set to miss the next three games against Huddersfield, Southampton and Wolves. There was plenty of discussion between Deeney and referee Craig Pawson but he was soon sent down the tunnel, and pictured watching on from outside the dressing rooms.